Unlike Michael Jordan, the man who has a statue on the east side of the United Center, Rose took a stand on a polarizing issue as a player. Last night, somewhere in America, Former Chicago Bull Craig Hodges was smiling. Hodges never minced words when it came to discussing the state of African-Americans—especially in the NBA. When the Bulls visited the White House after winning their first championship back in 1991, Hodges wore a dashiki while handing a letter to one of President Bush’s aides. Hodges criticized the NBA for the lack of African-American head coaches. At the time, the league only had two. He went on to suggest that the players should boycott a playoff game. He was cut by the Bulls after the 1992 NBA Finals. Despite being one of the NBA’s best three point shooters in league history, he never played again. These days, professional athletes are often chided for not taking a stand on polarizing issues like some of their predecessors did. And those who do are often ostracized. Bulls point guard Derrick Rose, one of the NBA’s most popular—and inexplicably polarizing—players, took a stand Saturday night. 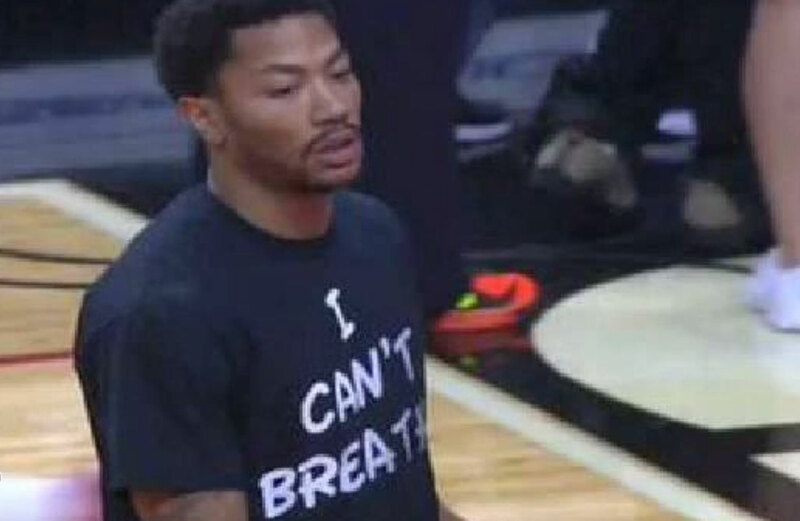 In the pregame warm ups ahead of their game vs. the Golden State Warriors, Rose wore a black t-shirt that read, “I can’t breathe.” Those were the last words of Eric Garner, a New York City man who died at the hands of a NYPD officer. The reaction on social media was immediate—and polarized. I respect Derrick Rose because he’s no hypocrite. Spoke out passionately this summer about crime in Chicago. That’s way beyond police issue. I’ve wanted to see this generation of athletes–who have often stood for nothing–stand for something. Now they are. That’s a great thing. I’m tired of the double standard for black folks. We can be good for sports but not support our own? How does that sound? @drose stick to playing basketball part time, leave your opinions off the court! The people who did not like the former league MVP’s choice of wardrobe made reference to his multiple injuries along with telling him to stick with basketball. Some of them even made reference to an alleged affiliation with the Gangster Disciples, a local street gang. I think a lot of people feel that way. When you wear a T-shirt with a statement everybody’s going to know how you feel about it. I respect Derrick 150 percent and I’m riding with him … a lot of people feel that way. It’s really sad what happened. Police brutality is something that … it happens. Not every cop is a bad person. Not every black person is a bad person. You can’t judge people. But he definitely made a statement by wearing that T-shirt. My biggest concern is the kids. I know what they’re thinking right now. I was one of those kids. When you live in an area like that and you’ve got no hope, and police aren’t treating you any way, I’m not saying all police are treating kids bad, but when you live in an area like that, it gives you another reason to be bad. So my biggest concern is the kids and making sure that my son grows up in a safe environment. Some in the media have branded Rose as “selfish,” but it’s worth remembering his recent history when it comes to social justice issues and philanthropy. He’s spoken out about Chicago’s gun violence problems multiple times in the past year. He attended the funeral of Endia Martin, a 14-year-old girl who was killed after she was taunted over a Facebook post. He also donated one million dollars to After School Matters, an after school program that keeps kids off of the streets. No one who is selfish does that. After all, Rose is a point guard. They tend to “assist” others from time to time. Jordan can never say that. Evan F. MooreTwitterEvan F. Moore is a multimedia journalist whose work has appeared in Thrillist, Southtown Star,RedEye Chicago, Huffington Post,Time Out Chicago and Community Media Workshop’s "We Are Not Alone/No Estamos Solos" project on youth violence. Follow him on Twitter @evanfmoore.